Description of "Holistic Approach To Employee Engagement"
Employee Engagement is the crucial element in the growth of the business. There are multiple dimensions of employee engagement, however managers and organizations don’t take holistic approach to employee engagement. Talent Management and employee engagement is widely discussed and unresolved mystery yet. It started long back with war of talent and still today issues are same and relevant with changing scenario. When you administer the employee engagement survey, you will find the career development is lowest score in any organization. Employee Engagement is not related to rewards and recognitions, fun activities etc, it is more than that, it is about employee experience. 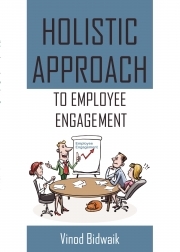 In this book, Author has captured some elements of employee engagement. There are some good examples with stories which will give you a different insight. Vinod Bidwaik is a seasoned HR professional with more than 18 years of experience in HR with 11 years of leadership experience in big Indian and Multinationals industries, viz: manufacturing, media, automobile and life science & material science companies. He has authored Marathi books, “College to Corporate, via interviews ('कॉलेज टू कॉर्पोरेट व्हाया इंटरव्यूह')”, “Swayamvikasachi Swayamprerna” (स्वयंविकासाची स्वयंप्रेरणा) & English book, “Password to Enriched Life”. He is the recipient of prestigious Asia Pacific HRM Leadership Award 2014 given at Asia Pacific HRM Congress held at Bangalore and “Vibrant Gaurav Puraskar 2016” given by Vibrant Group, association of HR professional & Pune HR leader 2017 by HRD Congress. At present, he is working with DSM India Pvt Ltd as Director –HR. He previously worked with Mahindra & Mahindra at their Engine Plant as a head- HR & IR, Semperit Group as a Plant HR Head and Sakaal Media Group as a Chief Manager- Corporate HR. He has an expertise working on Greenfield projects and establishing HR functions. His two blog http://vinodtbidwaik.blogspot.com/ and http://collagetocorporate.blogspot.com/ have a big hit among management professional and college students. Reviews of "Holistic Approach To Employee Engagement"